A trombone, with a string quartet, playing arrangements of American standards? It sounds rather unorthodox indeed, yet this is exactly what Spanish trombonist Víctor Correa proposes with Strong Bone. “This is the easiest way for someone who says who isn’t fond of Jazz to find something captivating about it; it will not bore you, it will not leave you indifferent,” says Correa. Strong Bone was born in the Mexican desert of Coahuila when Anna Arnal --viola player and Víctor’s wife -- got a contract with the local Philharmonic Orchestra. “At that point, I had had it with music,” says the musician, who didn’t hesitate to follow Anna into the barren lands of Torreón, willing to try his hand at something else and change career. Paradoxically, this is where he found himself pushed to his limits and began composing arrangements that could harmonize a string quartet and a trombone -- all the musical resources he had at that time. “I knew I was up to something,” states Víctor, recalling the experience of playing those first notes which would eventually become Strong Bone. Víctor has some trouble remembering the full names of his current lineup as, from the original string quartet, only Correa and Arnal remain. Where are the others? “Silly question,” Víctor says. It seems this is the way of Jazz musicians, itinerant artists whose agendas take them all over the place -- sometimes all over the world -- and this is why Víctor and Anna find themselves looking for violins and cellos wherever they take Strong Bone. Currently, they are joined by cellist Gustavo Cruz, second violin Zahil Guevara, and first violin Nabani Aguilar - but Víctor is already hunting for the next musicians who will join Strong Bone in Segovia later in December this year. Strong Bone is currently on an autumn tour that took off last Friday in Mexico City’s Jazz Place and will continue today in the Anglo Arts Centre, as part of its first Jazz Series, in Antonio Caso 127, San Rafael quarter, at 20:30. Admission for tonight’s concert is free of charge. Correa’s Spanish-Mexican Strong Bone lineup will also play tomorrow night at Jam Jazz, followed by a presentation in Cholula, Puebla at iconic Jazzatlán. In an interview with EL UNIVERSAL in English, Víctor Correa shares his views on the Mexican jazz scene, key names and the sinuous and somehow providential ways music had had with him over the years. Correa claims he doesn't come from a musical background and that there wasn't a specific band, group, or music genre which had an influence on him. Víctor Correa found music – or perhaps, music found him – during his early teens when he joined the local brass band of his hometown. Piston trombone in hand, Víctor never questioned his instrument of not-choice - although he did exchange it for a tenor trombone later on -- as he kept furthering his musical education in the Spanish countryside. Yet, once he moved to Madrid he became exposed to a musical world he had never known before prior to beginning his studies at the Escola Superior de Música in Catalonia. In Barcelona, he found himself discovering music through the creation of his own compositions and arrangements. Víctor pursued a musical career in Spain; however, his disillusionment with it led him to quit and agree to move to northern Mexico to try his hand at something else. Paradoxically, it was in the desert of Coahuila where inspiration struck and he found himself composing arrangements once more, but this time with a string quartet, no less. Although it was more an “exercise on survival,” Strong Bone has certainly managed to blend both jazz, pop and classical quartet influences into a delightful and experimental set for those eager to appreciate innovative takes on the Beatles’ songs or classic American jazz standards. 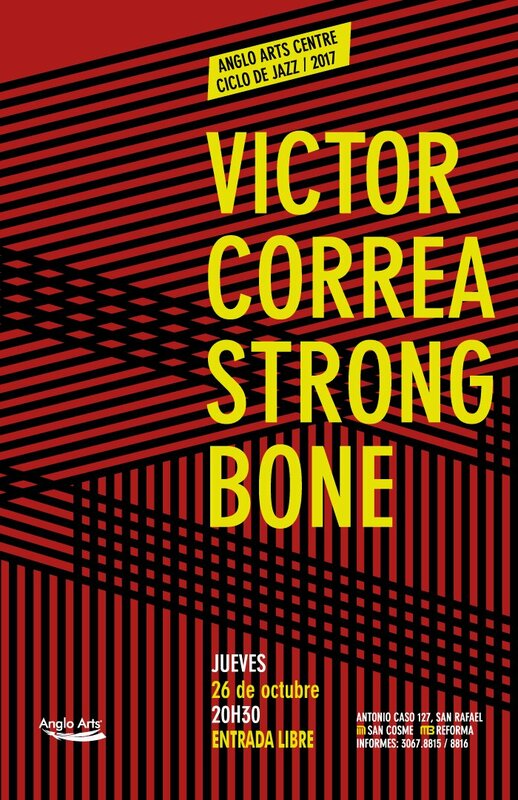 “This is a set I have crafted meticulously, not a single detail was left aside.” says a proud Víctor Correa from the themes, both arranged and composed for the Strong Bone album. And while he might yet find himself in Alaska hunting bears or as part of the crew of a merchant ship, for now, Víctor Correa and his string quartet continue to delight us with Strong Bone today at the Anglo Arts Centre, where they will debut their new arrangements of La tarde by Sindo Garay and Eric Harland’s Treachery.